The IRIS facility, is an innovative rare isotope reaction spectroscopy station led by Saint Mary's University, Halifax, located at TRIUMF. To reach into the heart of the rarest isotopes, the facility utilizes reactions with a frozen (solid) hydrogen target, a pioneering attempt for such investigations in the world. It was commissioned in 2012. How does nature stabilize the unbalanced ratio of neutrons and protons to form rare isotopes? 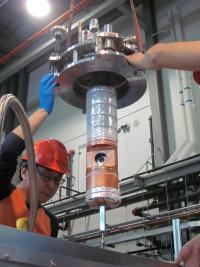 How does the neutron-proton arrangement change in rare isotopes? What is the neutron-neutron correlation in neutron-rich systems?